FGMF Architects signs two complete clubs, called Dom Pedro Complex, with accesses and external areas for sports and leisure. The architecture proposes a unique identity, independently of organizations of flows, spaces and dimensions and relations with views and surroundings, such as two projects in one. The new building may be understood as a big steel gray structure that was introduced in this small space between the neighbours and the street. This structure aims to support the slabs of the three stores and the roofing, also locking the preexisting neighboring walls. Due to the lot’s high unevenness, the restaurant has three stores—the ground floor, where the entrance, front desk, counter, table area and outdoor deck and terrace are; the basement, where the kitchen and other service spaces are; and a mezzanine-shaped upper floor that stoops over the entrance and has indoor and outdoor table area, and may be cut off from the ground floor in case of closed events. 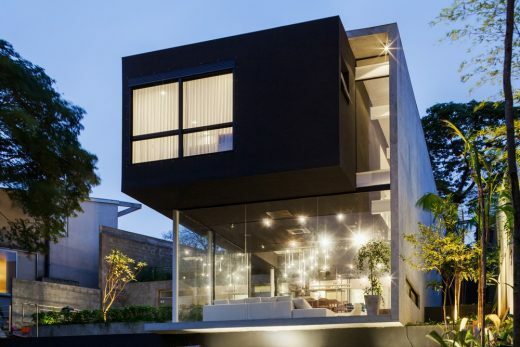 A project made for the design office Casa Rex, in the neighborhood Pacaembu, in São Paulo, Brazil. Plural, contemporary and investigative projects, concerning mainly the use of materials and the urban interaction, are fundamental characteristics of the works by Brazilian architecture office FGMF Arquitetos. Typical elements from infrastructure works were applied within this building, giving a different aesthetic effect to the project. Encrusted in a row of narrow geminate houses, the story began more as a challenge rather than as an architectural project. How make the entire program of a house fit in that 4x30m lot, relying on a few illuminated surfaces? Even though the object is deceptively simple, the answer came across a lot of research. FGMF Arquitetos is led by architects Fernando Forte, Lourenço Gimenes and Rodrigo Marcondes Ferraz. 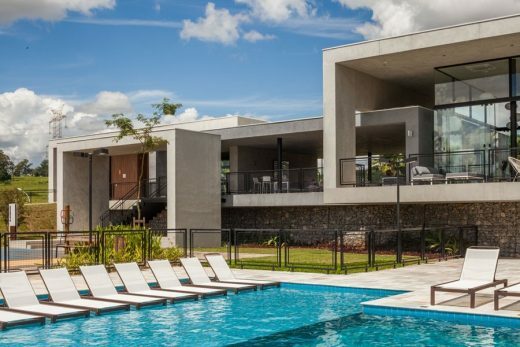 More than 15 years ago, when they decided to open their own architecture firm, FGMF Arquitetos, the trio Fernando Forte, Lourenço Gimenes and Rodrigo Marcondes Ferraz already knew what they wanted to achieve: they wanted to be recognized by the academia and by the market for their original projects. With the purpose of developing a contemporary, investigative and innovative architecture, acting in all scales and programs, from the details of a residence to an urbanistic plan, it was this plurality, rather than specialization in a specific type of program, that helped define the firm’s DNA. Today, their portfolio includes over 320 projects. The firm made its mark in 2009, by integrating Wallpaper* Magazine’s Architects Directory, which featured the trio of Brazilian architects as one of the 30 most promising and breakthrough architecture firms in the world. Their projects have been published internationally in more than 20 countries, including the United States, Germany, China, Italy, India, Korea and Spain. Since FGMF was founded, they have received more than 81 awards, including the international Wan 21 for 21 award, where they were featured in the list of the 21 architecture firms of the 21st century. The firm also received the Chicago Athenaeum Award, in the USA; the AIT Awards in Germany; the Dedalo Minosse 2011 and 2014 in Italy; three Re-Thinking the Future Awards, a worldwide award that brings together the main names in architecture; and, recently, the firm received awards in two categories of the fourth “IIDA Best Interiors of Latin America and the Caribbean Competition”, organized by the International Interior Design Association (IIDA). In Brazil, there have also been multiple awards, including one from the Architects Institute of Brazil (IAB, Instituto de Arquitetos do Brasil), from the Brazilian Association of Architecture Firms (AsBEA – Associação Brasileira de Escritórios de Arquitetura); the 1st Azkononel Architecture Award, promoted by Instituto Tomie Ohtake; among others, ranging from residential projects to institutional, to urbanism. June 10, 2017 in Architects.